About Zanshin Environmental | Zanshin Environmental Networks Inc.
Laurie Hamilton is the owner and sole employee of Zanshin Environmental Networks Inc., and has been working in environmental science and land management for over 25 years, conducting vegetation, wetland and terrestrial ecosystem baseline and impact assessments throughout Western Canada. During her 25 years, she has developed multiple specialties across a variety of disciplines, as illustrated by her multiple professional designations. Her diverse skillset provides her with a wholistic approach to environmental and land use impact assessments, streamlining the needs of any project. Laurie Hamilton is registered as a Certified Engineering Technologist (C.E.T. 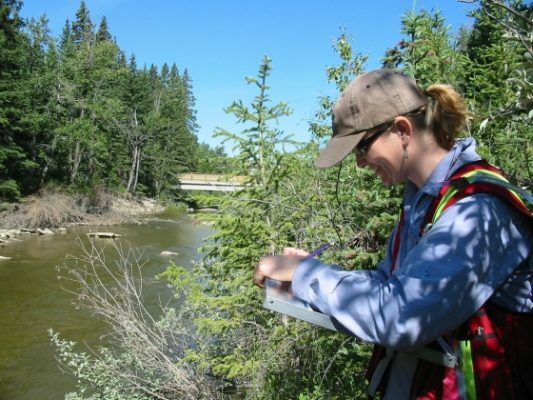 ), Professional Wetland Scientist (PWS), Registered Professional Biologist in BC (R.P.Bio. ), and Professional Biologist in Alberta (P Biol), and is an authenticating professional under Alberta’s Wetland Policy. Laurie has worked throughout Western Canada, from the high arctic tundra of the Northwest Territories, to the Pacific Ocean, to the dry grasslands of Saskatchewan, for a variety of sectors including oil & gas, pipeline, mining, transmission lines, urban/rural development, infrastructure, green energy, traditional land use, forestry, agriculture and conservation.